3rd Space Symposium is an interdisciplinary event which explores ideas around the imperative to decolonise the university, the role of creative arts in provoking change, and the dialectic between the settled nature of academic curricula and the spontaneity of transformation. Over a period of two days, academics, performers, curators, musicians, choreographers and playwrights – including key role players such as Hlonipha Mokoena, Elelwani Ramugondo, Jyoti Mistry and David Andrew, and artists such as Nomcebisi Moyikwa and Rehane Abrahams – gather to discuss the representation of artistic and creative research in museums, art schools and art institutions. Ideas pertaining to history and heritage, language, hybridity, creative economies and curricula are explored through presentation, discussion and performance. The horizontal, dialogue-driven format of the symposium encourages individual and collective participation, including group discussions and workshop interactions. The symposium wants to understand what potential the university curriculum has to respond to the fluidity of transformation. An enabling atmosphere must be created to enable students, academics, artists and the public to engage as a creative community, to grapple with legacies of violence and exclusion, and to envision possibilities for alternative futures. The original premise for the symposium came from Homi K. Bhabha’s notion of a hybrid “third space” that “displaces the histories that constitute it, and sets up new structures of authority, new political initiatives, which are inadequately understood through received wisdom”. However, by the end of the first symposium in the previous year, even this notion was rendered unstable. 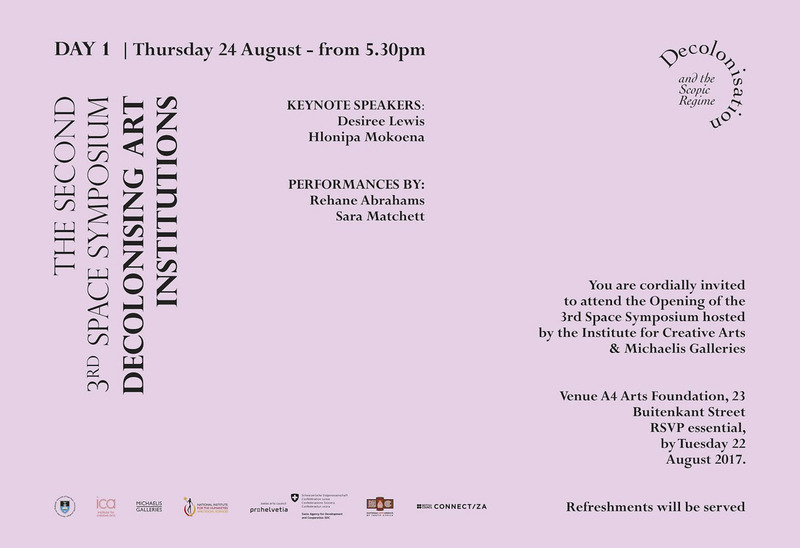 The second Institute for Creative Arts (ICA) 3rd Space Symposium: Decolonising Art Institution takes place at the University of Cape Town’s Hiddingh Campus and at the new A4 Arts Foundation space in Buitenkant Street.